The Home Park is a famous feature of the land to the north of Windsor Castle. It has been used for many years as a sports area, with archery, cricket, rugby and tennis all catered for. 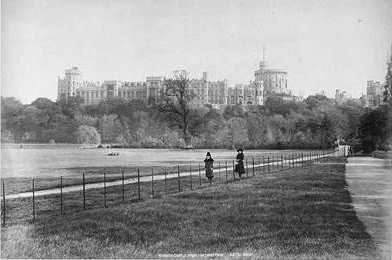 The area was also the home of The Royal Windsor Horse Show in mid-May until its move to the private area of the Home Park in 2005. 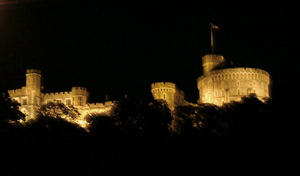 One of the most famous views of Windsor Castle must be from The Home Park, especially when floodlit on special occasions. This extensive area of playing fields, pitches and tennis courts dates back to the late 1600s when the first work was undertaken to construct a great garden on the land between Windsor Castle, the river, and Datchet. At one point in the 1680s Charles II had a plan to create a drive on the north side of the castle, exactly opposite The Long Walk, newly created on the south side. This did not materialise, but a garden was created by Queen Anne in the same area a few years later. It was named The Maestricht Garden, after a battle in 1673 in Maestricht, Holland. The battle had been recreated in the Little Park (as it was then known) over four days in August 1674 by James, Duke of Monmouth. In 1698 William III progressed plans for the development of the area by purchasing land between Windsor and Datchet and constructing a high wall around the garden area, following the line of the river, leaving just a roadway by the river's edge for travellers to and from Windsor and Datchet. Queen Anne came to the throne in 1702 and was keen to progress the plans for the garden. In a painting by Leonard Knyff, Windsor Castle from the North, c.1703, in the Royal Collection, the wall is clearly visible as well as a large number of formally planted avenues of trees in the garden area leading up to the slopes around castle. In the twelve years of Queen Anne's reign much additional work was undertaken with the creation of symmetrical pathways and tree planting plus a great lake or 'canal'. Spoil from the construction of this lake was used to improve Datchet Lane, the route around the outer wall, which was flooded on a regular basis. The lake was illustrated by Paul Sandby in 1765 in his painting The north front of Windsor Castle from the Maestricht Pond. It seems however that work on the garden itself was halted when Queen Anne died and the costs of the planned future improvements to the gardens were looked into. Thereafter the gardens rapidly fell out of use and were not maintained. A new Windsor to Datchet road was created in the late 1840s in return for permission to build the railway into Windsor. This road cuts through the southern end of the gardens. Also, the creation of the tennis courts, top left of the garden area, has also disturbed the ground too extensively for the paths to appear any longer at that point, but elsewhere the paths are very clear. Windsor Castle is visible at the bottom of the picture. We are grateful for permission to reproduce this remarkable photograph and the ghostly images from the past that it conveys. We are grateful to Tim Forbes of Canada for donating the original stereoview from which this picture was taken. 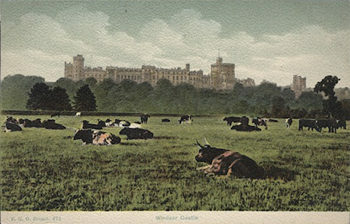 Along with views from the Brocas and Windsor Bridge, one of the most popular views of Windsor Castle is from The Home Park. Above we reproduce one of the earliest photographs believed to date from around 1875 and taken by Royal Photographer, George Washington Wilson. The original of this picture is a stereoview which can be seen as a '3D' image when viewed with the stereoviewers of the time. 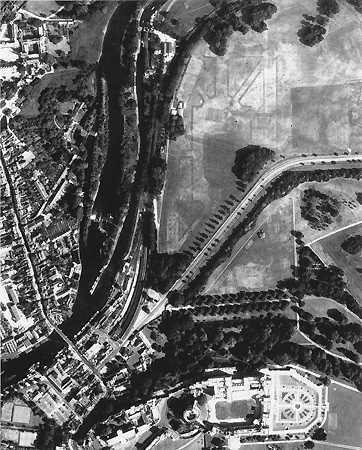 Across the middle of the picture runs the comparatively new road between Windsor and Datchet, crossing the river at Victoria Bridge. This road was constructed 24 or so years earlier in 1851. Beyond the road is the private area of the Home Park. The area to the right remains a small wood to this day, and now features a children's play area. In the view above, the road to the right leads to Romney Lock via a level crossing over the tracks that serve Windsor and Eton Riverside Station. Until the 1840s this road would have continued through to Datchet alongside the river. 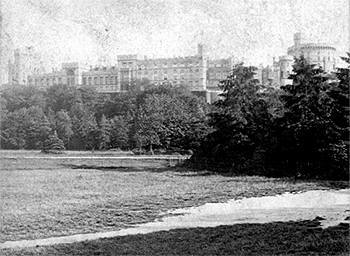 Apart from the tree growth which now tends to obscure the castle, and the felling of the large tree in the centre, little has changed in this view since 1850. This view by FGO Stuart is indeed rare and dates from around 1900. The Home Park has not been used for grazing cattle for many years, certainly not since WWII and quite possibly not since the early days of the 1900s. This view is taken from the area now set aside as cricket pitches.